Parents naturally want to do all that they can to encourage their children's healthy development. When it comes to language skills there are many things that parents can do to help their little ones to become good listeners and articulate speakers. Newborn babies need more than feedings and clean nappies. 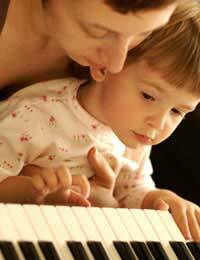 Parents who read books, play music and talk to their newborn babies are helping them to develop a basic understanding of language - its rhythms, tones and moods. This talking doesn't have to be "educational," in fact, it should simply be normal conversation as parents and babies go about their day together. Explaining what is being done as babies are being fed, bathed, and engaged with toys provides babies with their first examples of voices and conversations. Almost immediately, parents will find that the familiarity of their voices helps to calm their babies when they are fussy and before long, the babies will begin to respond to conversation by cooing and babbling. While it can be hard to resist a bit of baby talk, parents should avoid overdoing it. There is no need to refer to a bottle as a "ba-ba" or water as "wa-wa." Babies will certainly come up with plenty of their own cute terms for familiar objects, but adults need not start the little ones out with incorrect terms, which can often stick around far too long. It doesn't take long for babies to become toddlers and for toddlers to become full-fledged kids and while it may be adorable for an 18 month old to ask for "wa-wa," it's not nearly as cute coming from a four-year-old child. As babies grow, parents should look for opportunities to engage their kids in conversation. When talking to toddlers, parents should try to pose questions, encouraging their little ones to chime in. It's also important, especially with beginning talkers, to avoid giving them what you know that they want, rather than waiting for them to ask for it. For example, when a child points to his sippy cup, it's pretty obvious that he wants a drink. Rather than simply handing over the cup, though, parents should encourage the child to verbalise his request. As children grow, parents need to make an effort to keep talking, which most kids enjoy (well, maybe not teenagers!). Making the time to engage kids in conversations not only helps to build strong bonds, but affords children a multitude of opportunities to hone their language skills. Kids learn a lot from being with other people. Not only is interaction beneficial from a social standpoint, but it can also help to enhance a child's language development. Children get many opportunities to practice listening and speaking when they are enrolled in school or engaged in social activities. Varying environments are advantageous as each situation will likely require a slightly different action, helping to give children a well rounded experience. For example, attending a story-time session at the library will help enhance a child's listening skills as well as possibly increasing their vocabularies and attention spans, while playing with peers at the park encourages the art of back-and-forth conversation. While most kids progress along a fairly predictable timetable, there are times when children's language development seems to come to a halt or even regresses to an earlier stage. Parents should be alert to signs that their kids may be having problems so that they can seek the advice of a speech-language pathologist, speech therapist, or clinical audiologist, should the need arise. Most types of speech difficulties or delays can benefit from professional intervention, but it is always best to catch a problem in its early stages.